The Sand Wasp is a giant insect beast native to the deserts of the Borderlands. Sand Wasps buzz around, attacking with a melee sting, but they can also launch a ranged attack, firing out a string of tiny glowing green wasps. They are the same wasp essentially, but with different coloured wings. This Sand Wasp is a fairly weak monster when dealt with one-on-one. They become dangerous in groups, or especially on a crowded screen, since they can fire out repeated sprays of miniature wasps. These glowing green bullets cruise straight across the screen at a slow speed, but with several wasps firing them at once they can become quite numerous and more than a nuisance. Depending on what other monsters appear, it might be a good idea to try and kill one or more of the wasps, to make sure you're not drained from constant baby-wasp barrage as you are fighting more important foes, like a Desert Dervish. Stinger Missiles - Four green "mini wasp" projectiles that target your position from long range. They fly in a straight line so simply move to avoid them. Inflicts round about the same level of damage and has the same health points as the other two wasps, they just have different coloured wings. We have seen giant insects before, primarily in Diablo II, Act III. Whether this desert wasp has anything to do with the jungle one remains to be seen. 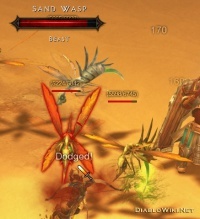 The Diablo I expansion (which is not quite canon) also had a multitude of insects, which could possibly be related. 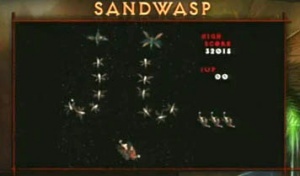 The Sand Wasp was first seen at the GamesCom 2009 demo and shortly after that at BlizzCon 2009. The inspiration for this enemy was old time arcade games, where players are forced to dodge bullets from opposing ships. The Sand Wasp is a natural creature. Not a demonic enemy. It's meant to show that the world of Sanctuary is very dangerous; it's not just the mutated demons that can kill you. Sand wasps are swarming creatures. They're not very tough on their own, and are a fairly easy kill for any character. They're dangerous in conjunction with others; other wasps or especially other monsters to occupy the character and let the wasps fire freely. We call multiple wasps attacking at once the "Bullet hell effect." where their mini-wasps clog the air. A pair of wasps hovering. This page was last edited on 7 February 2013, at 22:29.